"No one outside that gate wants you here… So do your job." Netflix has debuted an official trailer for an Iraq war drama titled Sand Castle, from the Brazilian director who last made the cult hit A Wolf at the Door previously. Set in Iraq in 2003 at the very beginning of the Iraq war, the film follows a couple of US soldiers trying to protect a small village that's under attack. The film stars Nicholas Hoult, Henry Cavill, Glen Powell, Logan Marshall-Green, Beau Knapp, Neil Brown Jr., Parker Sawyers, Sam Spruell, Sammy Sheik, and Tommy Flanagan. I'm surprised to see yet another new Gulf War movie, especially with this kind of impressive ensemble cast, considering they seem to be a dime a dozen nowadays. But hopefully there's something unique to this and it's better than it looks at first glance. On Netflix in April. Set in Iraq in 2003, Sand Castle follows a group of American soldiers in the early days of the second Gulf War. 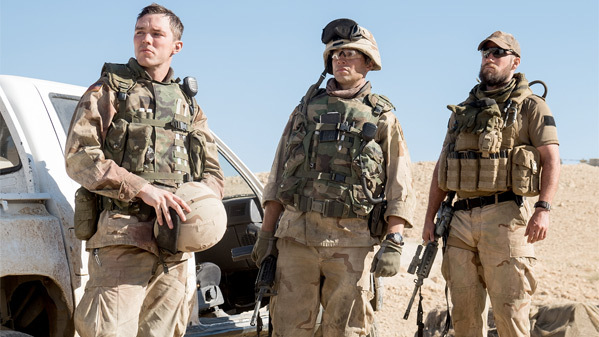 Bearing witness to the heat and the horror is the inexperienced Private Matt Ocre (Nicholas Hoult), who, together with several fellow soldiers, is ordered to the outskirts of Baqubah to repair a water pumping station damaged by U.S. bombs. But, as Ocre discovers, in an atmosphere where resentment and anger fester, trying to win the hearts and minds of the locals is a task fraught with danger. It’s here, in the streets, squares and schools that he discovers the true cost of war. Sand Castle is directed by Brazilian filmmaker Fernando Coimbra, of A Wolf at the Door previously as well as a few episodes of "Narcos". The script is written by Chris Roessner. Netflix releases Coimbra's Sand Castle streaming starting April 21st this spring.